Hey! I am a firm believer in small businesses and am always keen to get behind small passionate business owners, whether they are overseas or local. I think that it is always inspiring to see these small businesses working hard at something they obviously love to improve others lives or to give them a product that they will want to use. I think that the same money that we give to the big companies when given to a smaller business goes a heck of a long way and makes a bigger impact. That's why I have started a series in which I interview a lot of different small pet business owners and really put a spotlight on the work they are doing. I think this will be a great way to get some of my favourite businesses out there, and also work as an inspiration to people who are looking at starting their own business. Another month, another Bow Wow Box! This month our box got mixed up with some courier delivery problems and didn't arrive. Thankfully Andy is a great guy and sent us another box as soon as possible. The wait was torturous but well worth it because I really like the look of this box. 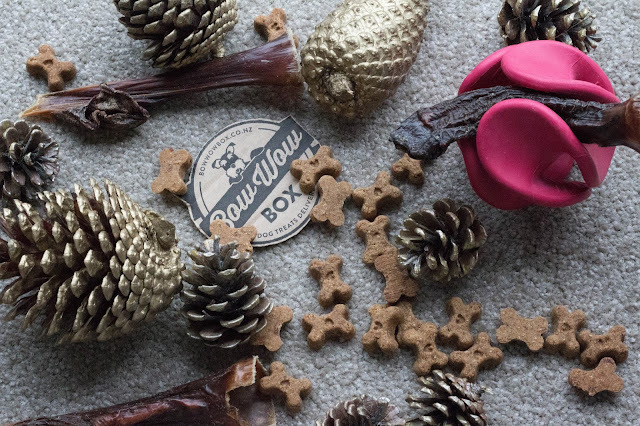 If you are new to our blog, Bow Wow Box is a monthly subscription service for dogs where they send a toy and some treats straight to your doorstep. We get the medium sized box which costs us $33.95 a month. First off we got Veal Bones.I love how we got a two pack, so I can give one to Diego and the other to Asha. What is great is that there is a sticker on the back side of plastic there is a sticker that states that these should only be consumed under supervision. Since these are unbranded I can't give you an exact price but I would say around $5 - 7 NZD for these. I can't speak for overseas, or even other regions of New Zealand but as for Wellington, we have a distinct lack of decent dog parks and walks. New Zealand is known for its amazing scenery, it's lush green areas and of course, sheep. However, dogs are not welcome in most of this, and every year the councils restrict us even further. The reason I write about this topic today is that one of our local off leash dog walks, is being threatened to be changed to leash only. The reason they are changing this on us? Because the Frisbee Golf players complained about the dogs getting in the way. Now is also a good time to mention that I have only seen people playing Frisbee Golf there once, and they were a family mucking around, not playing by any rules. Hey! 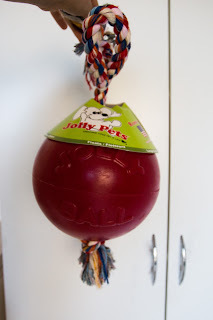 In April we got a package of dog toys from America in the hopes that their 'pitbull dog toy' status could stand up against Diego. We have spent the next few months having these toys constantly around to see how they last and if they last. To give you some context, Diego is a staffy crossed with a miniature dachshund however, 90% of toys that he has will be destroyed within a week. He will completely rip apart any soft toys he gets his mouth on within minutes, and has even chewed apart a Kong! Hey! We were lucky enough to win a contest to do a treat review on a mystery treat from Puss & Pooch. Puss & Pooch is an online pet store that imports quality, premium pet products and apparel directly from the USA. I have had all my interactions with Janelle who is the owner, and I have to say she has been a pleasure to deal with! Everything was sent out promptly, and she included a bunch of magnets, and a pen with the treats. 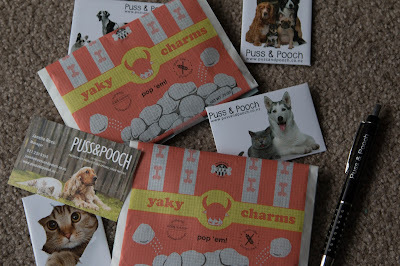 Puss & Pooch was established in 2011, and came about due to the fact that New Zealand lacks a bunch of the great products that America has. Along with these treats, there are a bunch of awesome products on their site, and I am very keen to make a large order when I can!